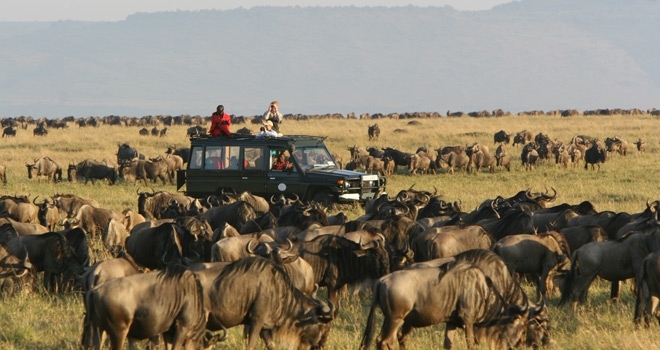 Kenya is one of Aardvark’s most popular family safari destinations. 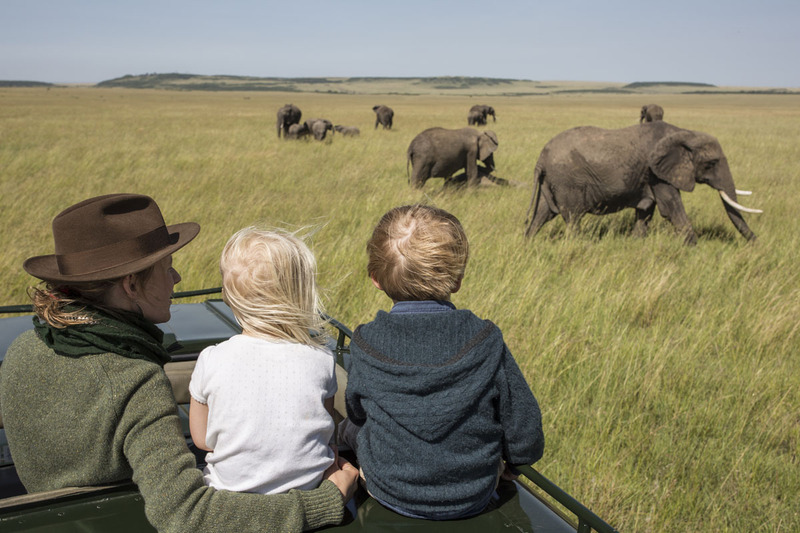 Charlotte Opperman flies out with her husband Peter and children for a Christmas in the sun on a Kenyan safari. 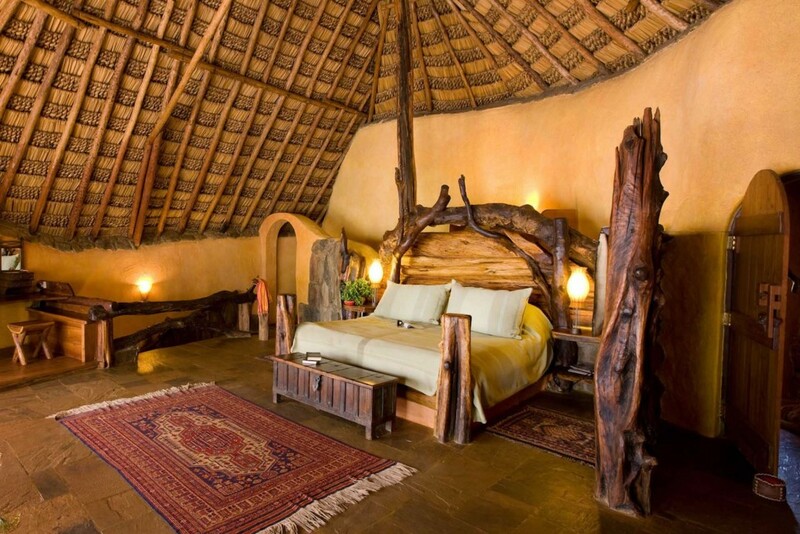 Our first stop was Rekero Tented Camp in a quiet corner of the Masai Mara, where many of our clients stay and the feedback is excellent. Since Rekero is unfenced and the camp is open to any animal that feels like wandering past, I had assumed the children (10 and 12) would each share a tent with either Peter or me. Masai host and head guide Jackson Looseyia had other ideas, and insisted that they were ‘warriors’ and must have a tent of their own. Despite my initial worries he was, of course, right. They loved the cocoon-like atmosphere of the tent complete with bucket shower, loo and solar lanterns. They slept right through all the nocturnal activity outside. It also made them completely responsible. They obeyed the instructions not to open the zip until they were fetched in the morning. So much so that they didn’t even stretch out an arm to collect the morning hot chocolate and biscuits left on their veranda. Our eagle-eyed guide James was an entertaining companion on wildlife drives and managed to find plenty to keep us all interested. One of his more unusual finds was a zebra that had somehow got itself wedged in rocks in a river bank. He decided it was worth seeing if we could release it, and the boys got stuck in trying to help. Unfortunately after 20 minutes or so it was plain that the zebra was exhausted and we were going to have to leave it to its fate. We spent one morning looking for rhino but had drawn a blank until we decided to stop for breakfast. By this time the boys had been armed with Masai bow and arrows and were shooting off the top of the hill. When we were searching for a misfired arrow we stumbled across the elusive rhino – perhaps not a conventional way to track animals, but effective. After three great days, we flew to Ol Malo in Laikipia. Our plane swooped over flamingos on Lake Nakuru, accompanied by yells of ‘cool’ from the boys through the plane headphones. Flying over a small herd of elephant elicited more ‘ooing and ahing’. 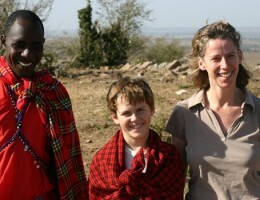 Colin and Rocky Francombe run Ol Malo and we felt part of their family during our Kenyan safari. With an infinity pool to die for and comfortable rooms it was a great place to relax after all the wildlife activity at Rekero. There is game in the area, and though it is more dispersed than in the Mara we did sight leopard – a thrill for all. 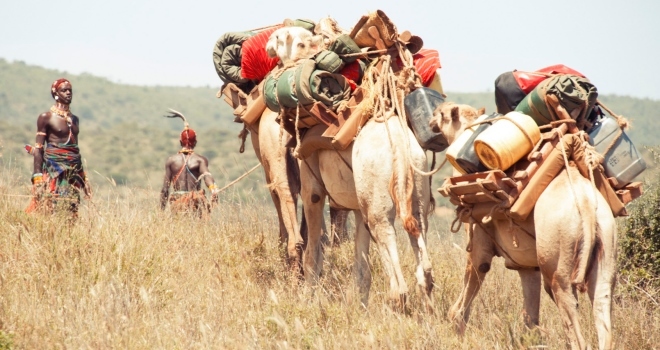 We also rode camels on our Kenyan safari. Ours might have been about the slowest form of conveyance there is, but great fun none the less. 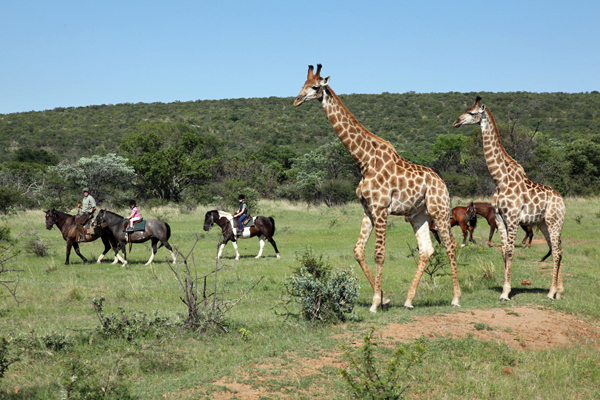 The horses were faster, and there were mounts for both beginners and experts so it was a fun way to explore the bush. 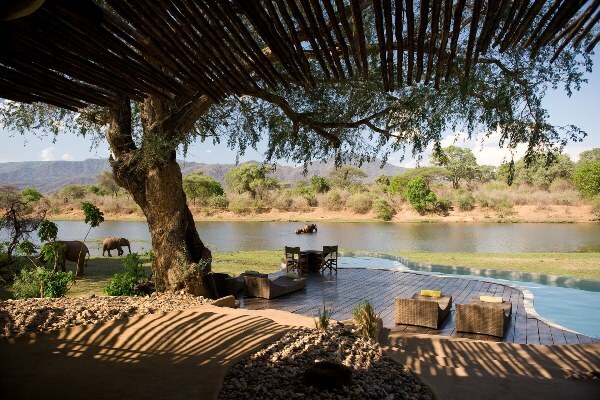 The Ol Malo highlight was the day we, and the other family staying at the lodge, spent by the Ewaso Ng’iro river. The camels carried a wonderful picnic down to the riverbank and by the time we arrived all was set up. There were even inner tyre tubes to use as floats down the little rapids (no crocodiles or bilharzia here). After swimming and mud slinging we had a great lunch followed by a competitive boys v girls fishing competition. It was touch and go for a while but the boys won 15 to 12. Our Samburu guide, Hussain, understood the boys well and added to the weapon collection with a knobkerrie (Samburu fighting stick) for each child. These beautifully made but lethal weapons were just a start for our two boys, who added a complement of miscellaneous sticks for good measure. An overnight stop in Nairobi was spent at Giraffe Manor, where the next morning a giraffe came so close we could feed her cattle nuts from our first-floor bedroom window. Highly entertaining, and it was great to see these fabulously elegant creatures up close. The final four nights of our family holiday were on the beach at Manda Bay near Lamu, where I promptly lost my husband to the temptations of salt water fishing and the boys to an assortment of water sports. I hardly missed them. 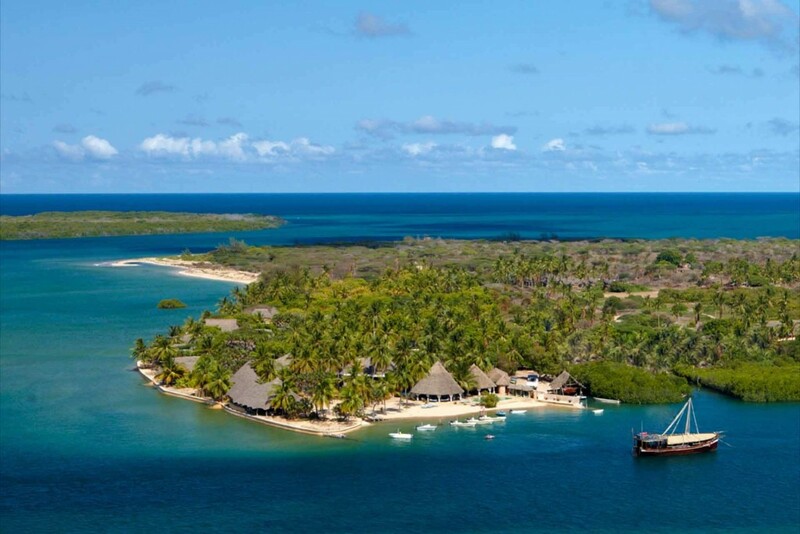 Twelve luxurious thatched cottages spread along a glorious expanse of sandy white beach proved the perfect setting to wind down after all the excitement of the previous ten days of safari. 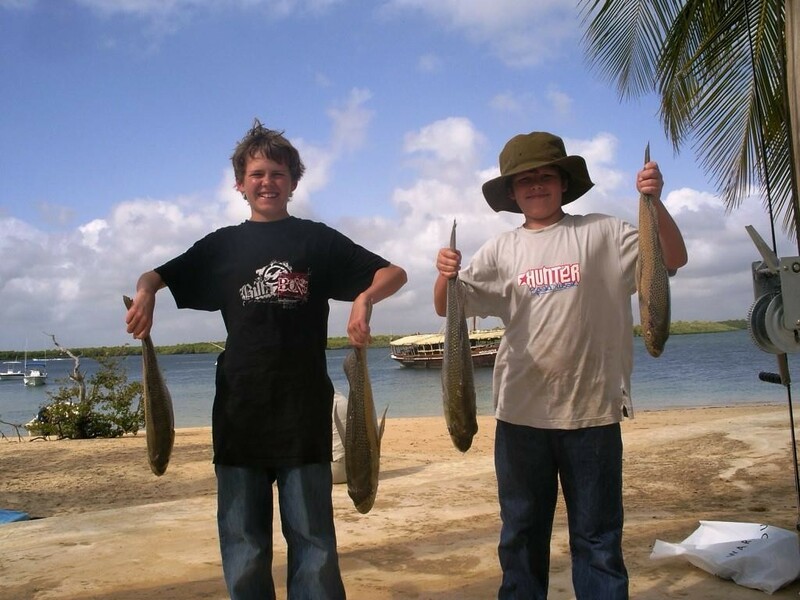 We were served some of the best seafood I have ever eaten and divided our time between dhow trips (a must), fishing and watching the boys windsurf and wakeboard. Our four nights sped past. Back home, we now have an assortment of strange weapons cluttering up the house which, together with hundreds of photographs, will remind us of what was a truly superb – perhaps our best ever – Kenyan safari family holiday. I’ve travelled extensively during my time with Aardvark Safaris and taken my family on a number of holidays in Africa and the Indian Ocean. 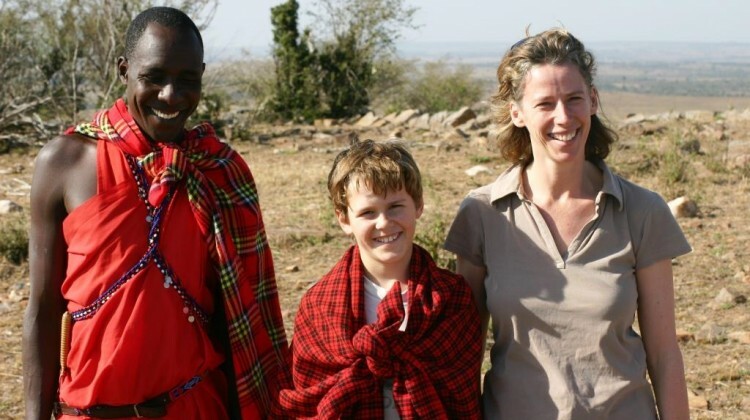 If you have questions on Kenyan safari family holidays or elsewhere in Africa, please ask in the comments. I’d be very happy to answer you and may even amend the article if it’s something that will help others planning a family holiday themselves. 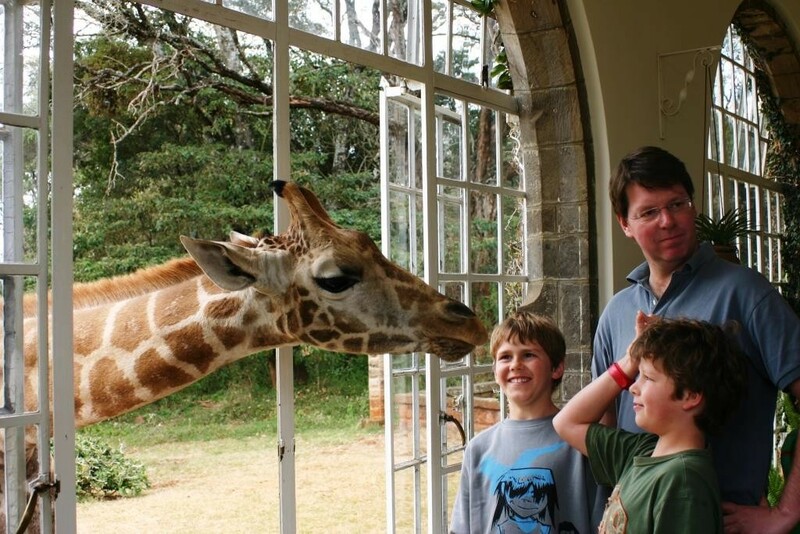 We would be delighted to help you plan a family holiday to Kenya, or answer any questions if you’re at an earlier stage. Our team of experts have travelled widely throughout Africa and can offer expert advice on every type of safari from family and beach holidays to riding and primate safaris. If you would like to talk to someone who has been there and done it, please just send us an email or give us a call.